Outhalf Jack Crowley crossed for a try and kicked 10 points as Bandon got the better of Skerries in last Saturday’s IRFU Under-18 All-Ireland Cup final, adding to the west Cork club’s U-19 All-Ireland title from 2013. It was Bandon’s first time to play Leinster opposition and they came up trumps, outscoring Skerries by two tries to one in the first half with Jack Crowley’s lone penalty in the second period proving to be the match-winning score in the midlands sunshine. The Under-18 national final was played in perfect conditions, with the 4G pitch making for a very fast-paced contest. With a light breeze at their backs from the kick-off, Bandon made good use of the elements and pinned back Skerries deep in their own half. While Crowley kept his pack on the front foot with some great kicks to the corners, Skerries were unsettled in the opening quarter by an early yellow card for openside Patrick Hutton and a blood injury to number 8 and captain Cian Darling. Bandon’s early pressure resulted in a series of rucks near the Skerries line with centre Sean Galvin managing to crash over for the opening try after some nice hands through the back-line. Crowley’s conversion made it 7-0 the Cork youngsters, just reward for their strong start. Skerries could not get out of their own half with Bandon holding onto the ball for long periods, and some great carrying by Conor Heaney and Ben Donegan resulting in a Bandon penalty which Crowley fired through the posts in the 25th minute. Skerries out-half Shane Murphy, who earned Leinster and Ireland honours this season, had Bandon under pressure with some hanging restarts and, as a result, the Dubliners finally gained some meaningful possession in the Bandon 22. After a series of lineouts and rucks near the Bandon whitewash, they barged over through lock Paddy Fay-Watt. Murphy added the extras to leave three points between the teams. The Munster champions hit back by regaining a foothold in the Skerries half and holding onto possession through some excellent lineout takes by captain Josh Brady and barnstorming runs by Alex O’Connor and Tadhg Galvin. That lead to quick ruck ball and a fast pass from Ciaran Roberts gave his half-back partner Crowley the opportunity to exploit a gap in the Skerries defence and touch down. He converted his own try for a 17-7 lead at the break. Crowley kept the scoreboard moving in the right direction for Bandon with a 42nd minute penalty, as his well-struck kick from 30 metres sailed over. Skerries’ response was encouraging, their pack coming more and more into it with their picking and mauling around the fringes. With 20 minutes remaining, the young Goats turned down a kickable penalty and were swiftly dispossessed by a superb rip in the tackle. Nonetheless, the lineout exchanges were now going Skerries’ way and they had most of the possession inside Bandon territory. The pressure led to Bandon being reduced to 14 men on two separate occasions as Skerries threw the kitchen sink at them. A patched-up Darling was simply immense during this period, but he missed out on an almost certain score when he was held up over the line by Sean Galvin. Fay-Watt also went close to notching that elusive second try. Bandon finally cleared their lines after surviving a prolonged onslaught from their Dublin opponents, and referee Karol Collins blew the final whistle just a few minutes later. 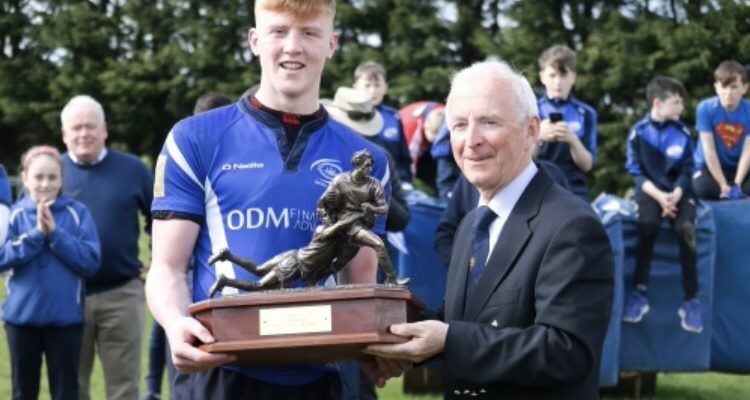 When Bandon captain Josh Brady was presented with the trophy by Michael Cunningham, Chair of the IRFU Youth Rugby Committee, the celebrations could be heard all the way back in west Cork. The victorious Bandon camp were quick to salute the beaten finalists, with team manager Bob Brady saying that ‘Skerries can be very proud of their team who gave it everything, but our defence in the second half won the day.’ It could be an historic seven days for Bandon as their seniors have a shot at promotion to the Ulster Bank League this coming Saturday against Bruff. Notably, the newly-crowned U-18 All-Ireland champions are back-boned by students from Bandon Grammar School with eleven of their players attending Darren Sweetnam’s alma mater, while the Skerries U-18 squad includes 17 players from Skerries Community College, including injured centre Thomas McBrien. BANDON: Joe Crowley; Harry Hall, Sean Galvin, Eoghan Guineavan, Matty Crowley; Jack Crowley, Ciaran Roberts; Conor Heaney, Alex O’Connor, James Collins O’Brien, Ben Donegan, Conor Keogh, Tadhg Galvin, Josh Brady (capt), Padraig Galvin. Replacements: Sam Golden, Tom Bryant, Ronan Cremin, Mark Fehilly, Johan van der Westhuizen, Frank Toner, Denis McCan. SKERRIES: Oisin McKee; Paddy Woods, Patrick Finn, Mark Mulcahy, Declan O’Reilly; Shane Murphy, John Healy; Cormac Murphy, Oisin Cousins, Sean Keenan, Paddy Fay-Watt, Joe Mulvany, Johnny Clear, Patrick Hutton, Cian Darling (capt). Replacements: Mark Coomey, James Mulvany, Jake Chapman-Hughes, Kevin Varga, Ronan McNally, Ciaran McKeown, Donal Cotter, Sean Cahill.